Neuways’ Managing Director Martin Roberts (left) and Business Technology Consultant Toby Stephenson. Derby-based Neuways has been recognised as one of the top 5% of global partners by Datto, the provider of IT business continuity and disaster recovery (BCDR) solutions. Neuways has achieved Blue status as a result of a continued commitment to delivering BCDR solutions to their customers. This comes off the back of Neuways’ Datto Unified Continuity Partner of the Year (UK and Ireland) award in November 2018. This means that Neuways, a local IT business with clients across the world, is now one of the leading providers of IT BCDR solutions in the country. Following on from 2017’s move into a brand new £1.2 million site in Chellaston, Neuways has increased its head count by 50% in the past two years and continues to expand. 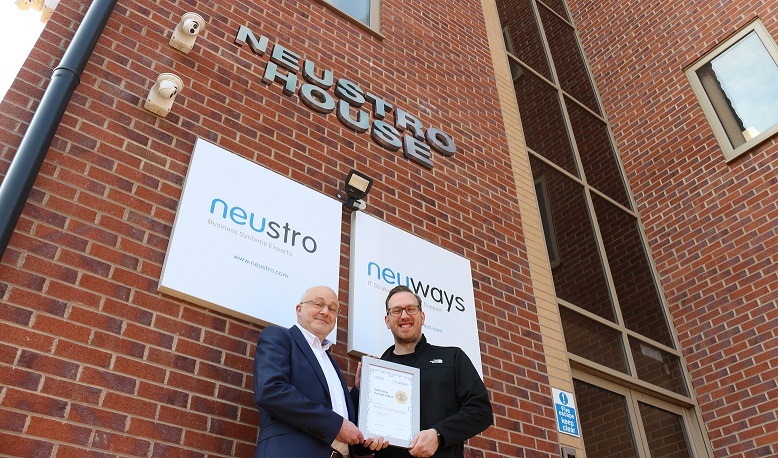 This accreditation acknowledges Neuways’ growth to date and allows the business to focus on continuing to keep UK businesses safe from an ever-increasing cyber threat landscape. Neuways expects turnover to double in the next couple of years.